When I started as a spinning instructor, my goal was to be known as the instructor with great music. I’m pretty sure I’ve succeeded in meeting this goal. I think I’m also known as someone with really hard workouts (I often promise sore buns). This week I’ve had several people comment on how they’re impressed with my use of Johnny Cash. I’ve been pretty surprised how much I love teaching. It’s been so fun. I’ve said before that I don’t really like indoor cycling (it’s hard and boring) so I wasn’t expecting to like leading cycling classes much. I was mostly doing it to make some money and force myself to spin. But it’s been so fun! I definitely feel myself getting way stronger and better at both cycling and running (I’m running a lot faster). I love helping people get their bikes adjusted properly and pushing them to do more than they think they can. Recently I helped a guy change his set-up just a tiny bit and he said it was the first time he’s done a class without his knee hurting! Anyway, back to the purpose of this post: music. After every class I have people telling me how much they loved the music and how motivating it is and exciting to anticipate what comes next. Recently I’ve had people telling me how much they appreciate playlists without Katy Perry. Since I’m now teaching at a couple gyms with different class lengths, I have most of these playlists in 45 minute and 55 minute options. 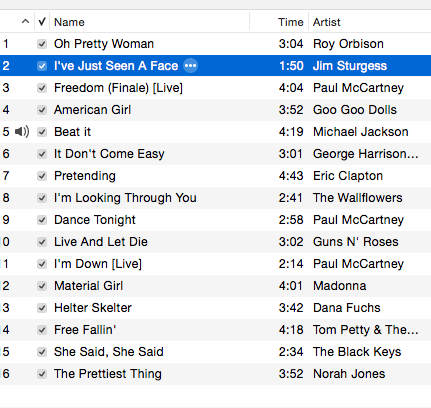 Women Who Rock – I have ideas for a 2nd Women Who Rock list but I just don’t have the songs for it! Non-Beatles Beatles – all music and/or artists that can somehow be connected to the Beatles, this is the list I’m most proud of, nobody has guessed the theme yet! 60s – 70s – this and the Beatles list are the two favorites I think, this is a hard class! I think Sunday mornings beg for Eric Clapton and would love to do an entire Clapton class but, unfortunately, I assume I’m the only person who would be excited about that. I’ve got bunches of ideas for future themes and several playlists started (and, of course, my iTunes wish list keeps getting longer and longer) so I’m excited to see what I’m come up with in the next few weeks and months.